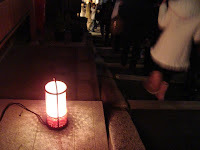 I've already written about Higashiyama Hana Touro before. This year has been seventh time since the first one was held. It's getting more popular and more people come to Kyoto. There were many lenterns along narrow streets. It looked completely different from day time. Higashiyama Hana Touro means literally Higashiyama flower lentern. 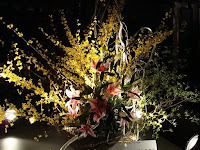 As its name, many Ikebana (arranged flower) were displayed. 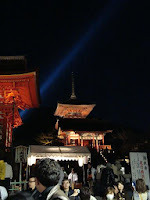 Some temples or shrines were also decorated with lights during Hana Touro. 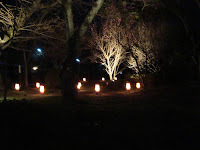 Middle of March is still cold in Kyoto, but I think it's worth visiting. Winter season is low season, so it is not very crawded everywhere. 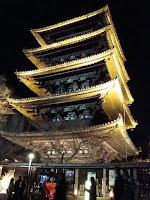 Why don't you come to Kyoto during winter?? As we announced, tea cremony was held several times. 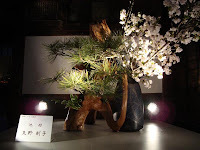 Next tea ceremony held on March 28 was supposed to be the last one. But we extend the date of it. Everyone who attended tea ceremoney had fun and told us that was great. Unfortunetly beginning of April is very busy season, so we are almost fully booked. But April 24th is still available. If you missed it, why don't you come here and try tea ceremony with us? 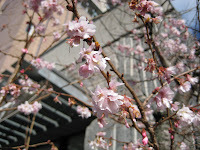 According to meteorology agency, cherry bloossom starts to bloom around March 27th in Kyoto area. It could be earlier or later. Nodoby knows. One thing I can tell you is that Kyoto is the best place for cherry blossom! I hope everyone coming to Kyoto during Sakura season can see beautiful and unforgettable cherry bloossom! 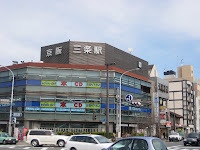 I will introduce some nice places near Keihan Sanjo train station. 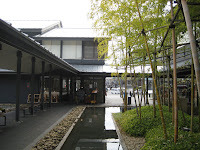 It is not far from NISHIYIAMA RYOKAN and when you go to Fushimi Inari shrine, Keihan train is very convenient. When I walked through Sanjo st. I found a candy shop randomely. 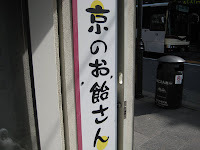 It is written Kyoto's Candy store on the sign. 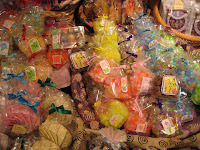 The store is very colorful with many sorts of candies. It seemed like spring has come only this place. There is a T-shirt store jest few meters away. 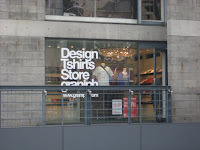 It's called "Design Tshirts Store Granigh" They have many different designs T-shirs. Find your favorite one! 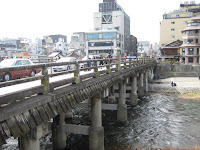 Before Sanjo station, there is a wodden bridge. Kamo river and this bridge match very well. This is the place for me that I can feel I'm in KYOYO. As soon as acrossing the bridge, you will see Keihan Sanjo Staton. 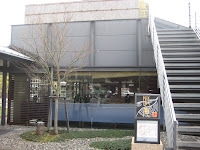 Across the station, there is a restaurant complex. 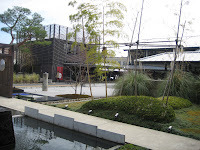 The name is "KYOUEN"
There is a Japanese Zen garden inside of it. Some bamboos are also there. They are Italian, Spanish, Noodle, Japanese or cafe. Choose one depending on your mood!